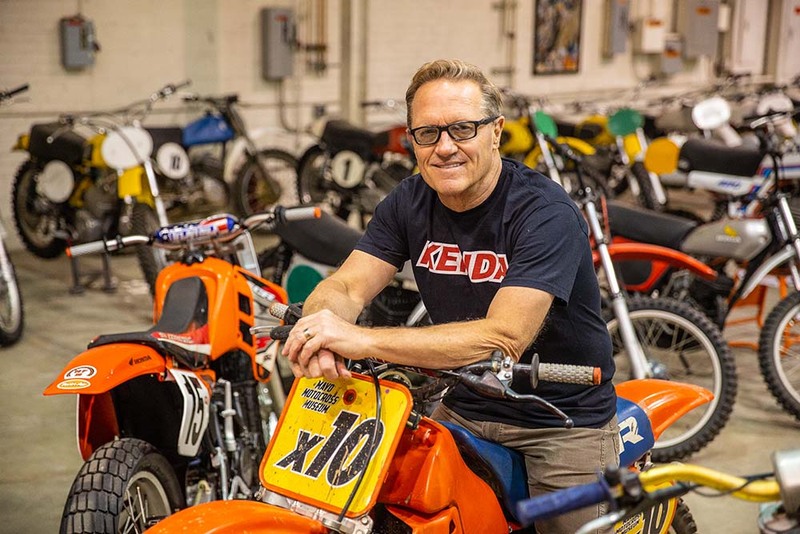 Tulsa developer John Snyder owns a vast supply of motorcycles that will be on display in the Mayo's Motorcycle Museum in 2019. Developer John Snyder’s affinity for historic buildings and motorcycles results in a new museum in Tulsa’s East Village. John Snyder racing motorcycles again means Tulsa will get a new tourist attraction. 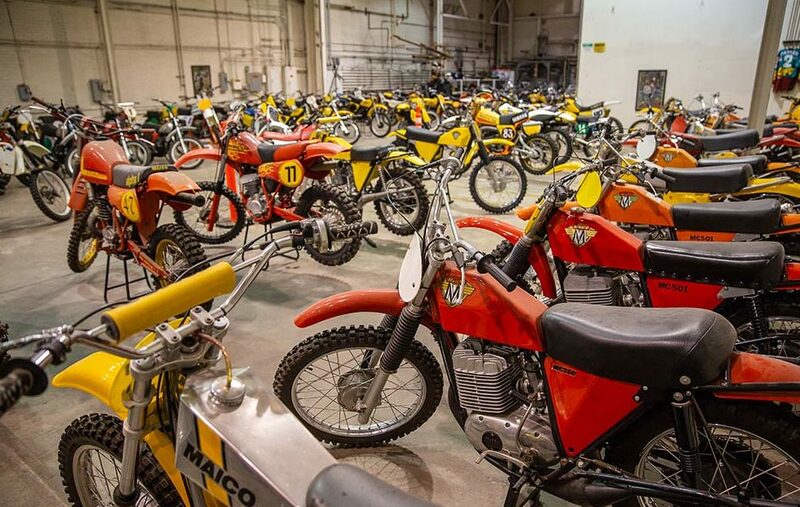 The Mayo Motocross Museum is set to open in mid-2019 at the former campus of NORDAM Aerospace Manufacturing in the East Village near downtown. The industrious Tulsa developer and his family bought the site in 2016. 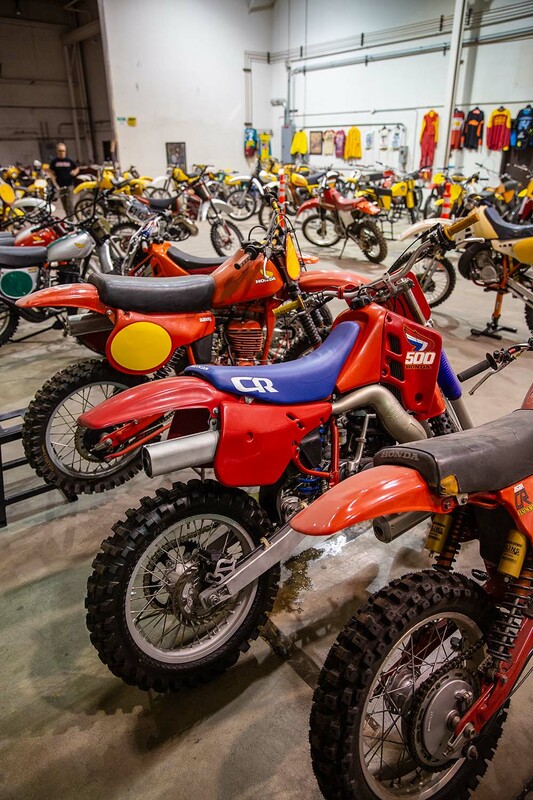 Snyder, 61, started collecting vintage motorcycles about a decade ago, and that was enjoyable enough. 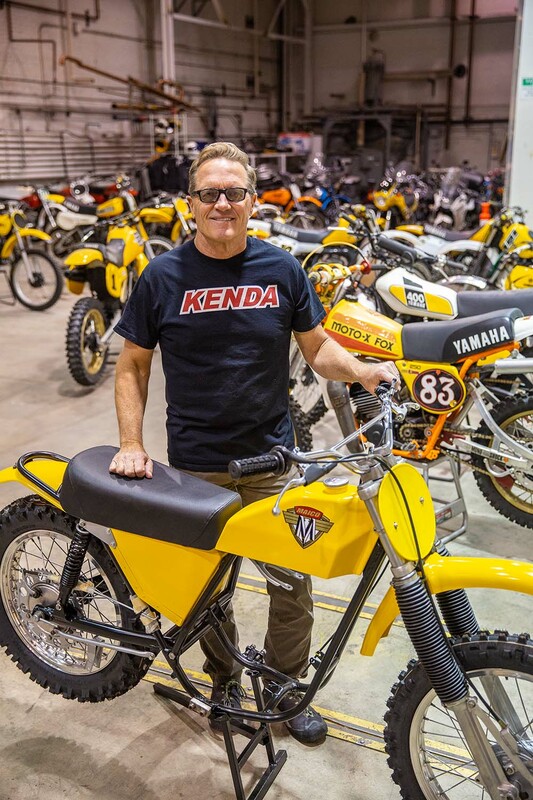 However, more than 40 years after going off to Texas A&M University and leaving his childhood hobby behind, Snyder took up vintage motocross racing. And now he’s really having a good time. About once a month, he attends a meet sponsored by the American Historic Motorcycle Racing Association. He’s usually on his 1972 Czech cycle or a German model long out of production because at those Saturday races everybody rides a motorcycle built before 1974. Male racers compete by age group, usually starting in their 40s, Snyder says, and there’s also a women’s event. At a race in Jefferson, Texas, Snyder marveled at a 90-year-old rider. Races are held on dirt one-mile ovals, on trails winding through trees and around rocks, cross country or on an open road. To Snyder, competition has a different meaning these days. He has not suffered any injuries and does not expect to. Snyder owns about 200 vintage bikes, and he began sharing them with a pop-up museum in the parking garage and the lobby of the Mayo Hotel, which his family bought and restored in 2001. He took 20 motorcycles to exhibit during the T and S National on Sept. 30 in Henryetta, a race produced by friends Trampas and Sherri Parker of Okmulgee. Trampas Parker, the first American to win two world motocross championships, was inducted into the American Motorcycle Association Hall of Fame in 2007. 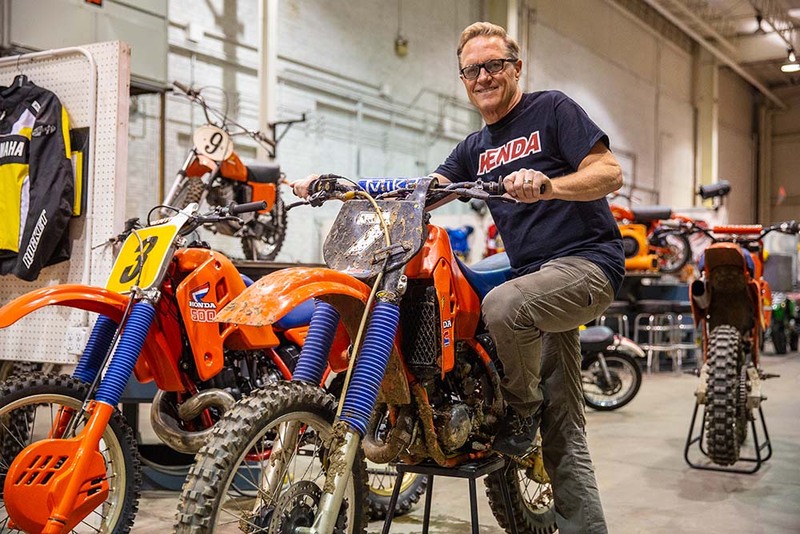 Parker says he will place some of his cycles in Snyder’s museum, including the 1991 Honda 250cc off-road bike on which he won one of his world titles. Parker will also share with enthusiasts his first-ever motorcycle, a 1978 Honda MR50 that’s been restored. Parker started racing when he was 7 and was 10 when he won his first big trophy. His career took him to Italy for 20 years, but now he’s back in the United States and participates in events reflective of his Texas upbringing, such as riding a bull for his 51st birthday. “I stayed on for 7 seconds,” he says. In 2012, Parker entered a vintage race. “I went out and did it and had a blast and have been doing it ever since,” he says. 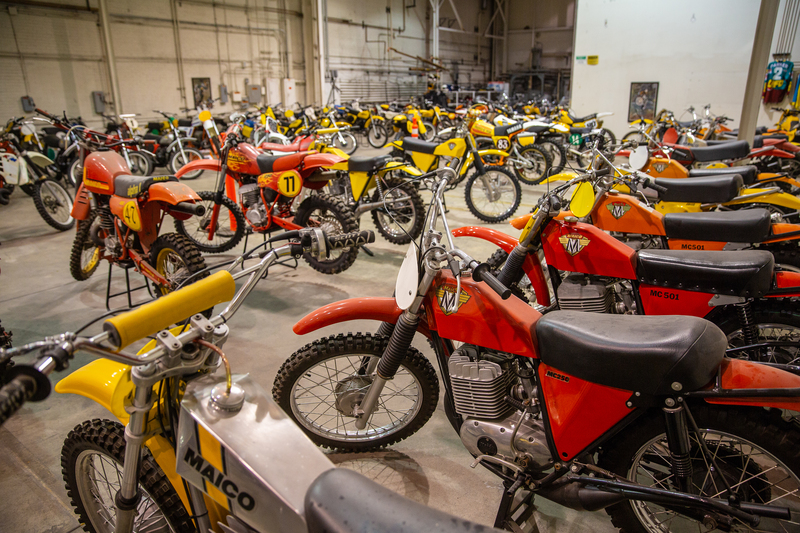 In addition to what Parker will offer, Snyder says he has talked with “a few collectors of really nice and rare vintage motorcycles.” He wants to open the museum with about 350 bikes. The museum, with free admission, and the 10.2-acre property will have a gift shop and a restaurant, Snyder says. The Snyder family has become known for projects with such vision. His youngest daughter, Shelby Hendrick, is president of Brickhugger, the family’s company, which converts historic buildings into residential, retail and hotel spaces. Hendrick was in college when the family started working on the Mayo Hotel, built in the 1920s. After the $44 million renovation, she says her sister Macy Amatucci started handling special events at the Mayo, which has 72 hotel rooms and 76 apartments, and manages the family’s three hotel properties. Snyder says his daughter Kellner Siegfried is raising her four children and not running any of the properties. Snyder says he spent 30 years with Manhattan Construction – half of that as Oklahoma division president. About seven years ago, he started his own construction company and expanded the family’s development interests. His wife, Tori, is an attorney working for the business. The family resurrected that residential heritage. 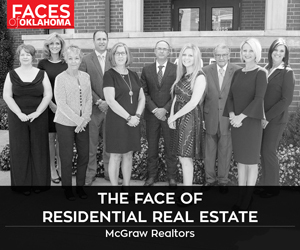 “We are the only hotel in Oklahoma that has residential apartments built in the hotel, which allows us to offer the same amenities to residents that hotel guests could have,” Hendrick says. In August, the family opened the former Triangle Building in downtown Pawhuska as the 20-room Frontier Hotel. Hendrick says Brickhugger bought it about the same time as the Mayo Hotel purchase. The timing was perfect because Pawhuska has become a mecca for fans of Ree Drummond, star of the Food Network’s The Pioneer Woman. Hendrick says her family went to work on the building after noticing that people were staying at Tulsa hotels and traveling to Pawhuska to visit Drummond’s Pioneer Woman Mercantile. Other historic conversion projects by Brickhugger include the McFarlin Building, the Detroit Lofts, the Vandever Lofts and the Y Lofts Downtown, the last being an old YMCA converted into 79 residential units. “That property is really cool because we were able to fully utilize the original features in the building,” Hendrick says. Brickhugger has also expanded to Lubbock, Texas, where 25 lofts recently opened in the old federal courthouse. As for the conversion of the NORDAM site into the museum, Snyder says people traveling Route 66, many of whom are on motorcycles, caught wind of his collection and have stopped at the hotel to see some of the bikes. But first he has a museum to build, and he wants to semi-retire at 65 and spend more time with his grandchildren. That tally is six and growing … because Macy is expecting twins.